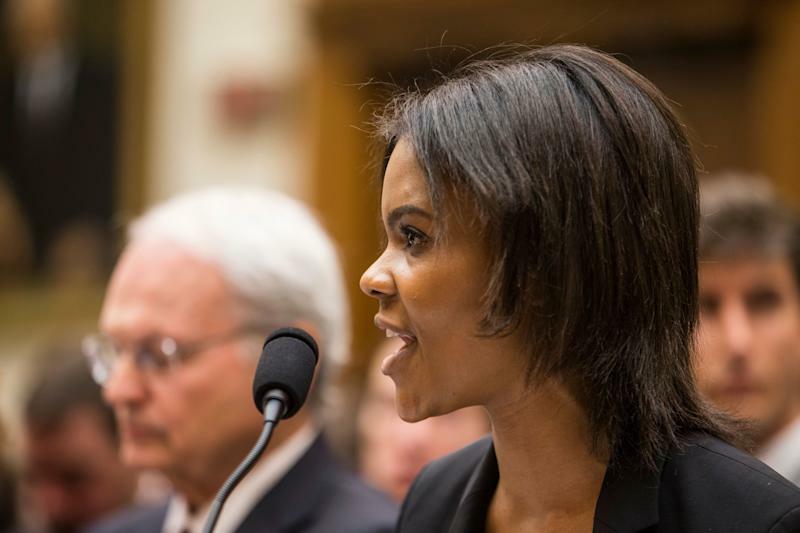 Yesterday morning in congressional hearings Candace Owens was confronted by an audio tape that Congressman Lieu played of her remarks concerning nationalism and Hitler, her response to his outright dishonesty by taking 30-second audio out of a two-hour tape, so as to show something that was not said as was shown, rather was taken out of context, was epic. 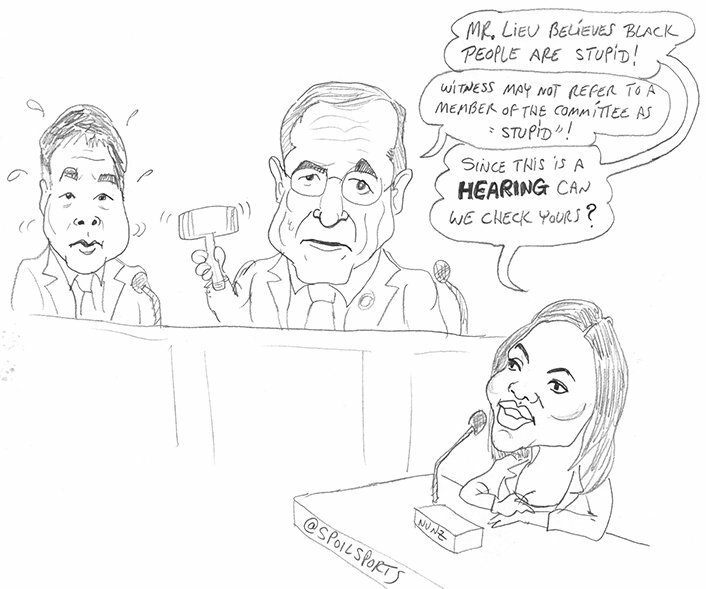 You could see at the time that Owens was not amused, the reaction by the head of the department, Congressman Nadler, in a typical move, showed he was not listening to what was said, heard Stupid and figured this was in response to Congressman Lieu (I must say, if the shoe fits, wear it), which it should have been due to his dishonesty, tried to scold Owens for something he did not do, then acted like it was not a big deal when she informed him he wasn’t listening. While she responded in a restrained manner, I must admit, I would have loved it if she had responded in the manner this cartoon by Dominic Nunziato shows, it would have been much more entertaining. This video was put out by the radical leftist with The Young Turks, as usual they miss out the fact that of all terrorist killings in the world, less than 3% were caused by White Nationalist, 97% were caused by Muslim radicals, but they don’t want this picture painted, it does not aid their narrative that somehow America is more racist then it was 60 years ago. Candace Owen is a threat to everything that the left is trying to push, she is a beautiful, intelligent, educated Black Woman, who refuses to play the victim, looks at the world’s events with logic, nothing could be more threatening to a party that wants all African Americans to feel that they are the victims of society. One can see by the attacks that the effort to discredit her is going to go into overdrive, the left has to destroy her, no matter the cost, such a voice should not, and cannot be able to be heard, she could up-end all they have pushed. Yet this is what the African American community needs, their youth to stop playing the victim, to allow no excuses, to contribute rather than demand the society owes them. She is determined to stop the cycle of perpetual victimhood, I have nothing but admiration for her. Here is the question I have, TYT focus on the 67 murders, and they were terrible, but what about the over 16,000 murders in 2018 and over 15128 murders in 2017, this is ignored, instead they focus on the 67, why ignore the rest? And want to know who committed the rest? African Americans commit over 56% of all murders in the US, that is African American males, they make up 6% of the US population, but to point this out, organizations like these radical lefts in The Young Turks don’t want these statistics known, it does not play into their narrative, more so when almost all these murders are black on black murders, this does not fit their victimization claim. I have to admit, I was sorry that I watched these speakers with TYT’s, made my head hurt watching such liberal looniness, further, their act of trying to act morally superior when they are anything but was rather tiresome, but that is the way of the left. I finish this with the reply from Candace Owens to Congressman Leia, I loved her reply, will admit the disdain this Congressman showed her was not surprising, this is the way of the loony left. PreviousCongressman Hank Johnson Attacks Trump As Hitler, Compares His Supporters To Fascist.